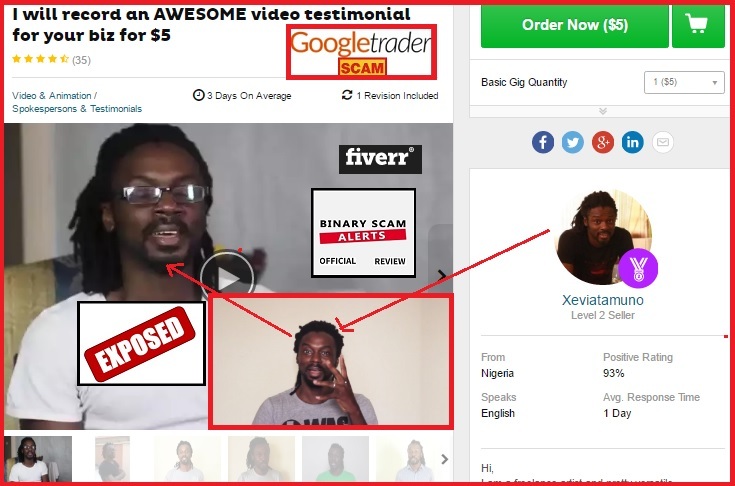 Binary Scam Alerts is posting a severe SCAM review and notification in regards to the Google Trader software, APP, and Auto-trader (AKA Gtradersoft) as well as Ben Williams the Fake CEO and confirmed Fiverr.com actor and cheater. We have recently received a request from some of our European members about repetitive and extremely annoying SPAM Email campaigns constantly badgering them and illegally soliciting them to join rogue offshore and unregulated brokers known for committing internet credit card fraud in the form of overcharging. We have compiled an extensive dossier exhibiting these crimes and will use it to assist our members if and when the time comes. But until then, our in-depth review and investigation clearly demonstrates a pattern of criminal behavior and proof of conspiracy to commit binary options internet investment crimes. We are warning all our members and viewers to use extreme caution if and when approached with this offer. Below you will find a screenshot of Mr. Ben Williams, the so-called CEO of Google Trader. In reality this person is a cheap actor that goes by the name of kscrowtb and you can see his gigs displayed very openly where he is offering his “spokesperson” services for a measly $5. As if you needed further proof, here you can see Xeviatamuno peddling his gig in a less-than-convincing manner. Well, at this stage I believe digging in further and examining the software is useless since we have just busted these crooks in a way which leaves no room for hesitation or margin of possible error. Fake testimonials are the preferred method of operation for scam-artists wanting to promote sleazy products online. So, here we have Mr. Ben Williams asking us to sign up for “the most advanced auto trading software in the world” which is powered by Google (that right there should get you suspicious). Then this ripoff artist continues to make false statements about the software making “$1,800 to $4,300 profits per day for free”. Now, if you have just a bit of life experience and have been manipulated or lied to before, you should know by now that there’s no such thing as a free lunch as Milton Friedman suggests. These are classic and recurring SCAM themes and soundbites designed to appeal to the most vulnerable and possibly needy section of the population. The well-to-do take 100K or greater sums and go to Goldman Sachs or Morgan Stanley and have a real investment portfolio drafted for them by a trained professional. But we all know this is not the case here, we are talking about average income earners (at best) just looking to supplement their income or alternatively people trying to make a career change and become a full time day-traders while trying to get out of the rat race. In reality, these hoodlums are professional swindlers who target innocent customers that will try anything to get a fair chance in life or alternatively kick start their financial situation. So if you are actually deliberating whether or not to buy into this system, you should be made fully aware of the fact that any type of professional trading tools such as candlesticks or bolinger band strategies on 60 second options will not help you achieve the desired ~ 85% ITM ratio. You must realize that you have been cheated out of your money and your next step should be to collect whatever amount is left of your balance and cash it out immediately. Well, actually it is not because you will need to part with at least $250 which is paid through one of their crummy brokers. These include but are not restricted to: The Lie Detector Millionaire, Profits Infinity, Cloud Trader, the Push Money App with Dennis Moreland, The Free Money System with Walter Green, Amissio Formula, Millionaire Blueprint, Regal Wealth, Insured Profits with Dave and Ginny, and the Quick Cash System with Sarah Markel. We are always getting asked if there are systems that we recommend. Well, the few and select ones that have passed our rigorous credibility test are proudly showcased in our recommended section. The Google Trader software, APP, and Auto-trader (AKA Gtradersoft) as well as Ben Williams is a verified and dangerous binary options investment SCAM. Our comprehensive review has proved this without a shadow of a doubt. There is not one thing which is legit, honest, sincere, or genuine about this system besides the intent of the people behind it to steal your money on in a quick and effective manner. This system will never produce profits on auto-pilot for you and intentionally take inferior positions while sharing the profits with shady, unregulated, offshore brokers. Join our Facebook Group and YouTube Channel to get informed.